To make the pork belly, put the meat into a saucepan with the star anise, cinnamon stick, bay leaves, fennel seeds and cloves with 500ml–1litre/18fl oz–1¾ pints boiling water. Simmer on a low-medium heat for 45 minutes. Drain through a sieve and place in a cold bowl. Cover with cling film and refrigerate overnight or for at least 1 hour. Slice the pork into 2–3mm thick slices and place in a small mixing bowl. Add soy sauce, sesame oil, sugar and corn flour and massage into the pork using your hands. Heat the oil in a wok placed over a high heat. When the oil is smoking, add the pork and sear well on both sides for 1 minute. Remove the pork and set aside, leaving the pork juices in the wok. To make the stir-fry, blanch the beans in boiling water for 2 minutes. Refresh in cold water and set aside. Add a little more oil to the hot wok and add the garlic, spring onion and onion and stir-fry for 30 seconds or until the onions are lightly browned. Add the red peppers, Chinese leaf and beans at 30 second intervals. Mix together the stir-fry sauce ingredients. 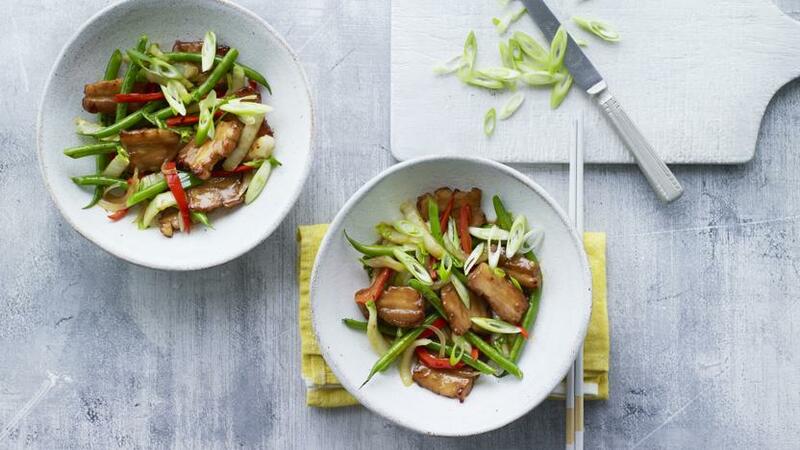 Return the pork to the wok with the stir-fry sauce and boil for 30–60 seconds stirring well. Tip onto a large plate or between 4 bowls, garnish with spring onions and serve.